As is usual for a wet day, few turned up (four) and they were regulars. So these secrets wouldn’t have been very secret, since I do this run every yer. We took the path to near the Innocent, but instead of taking the tunnel we took advantage of Sunday road closure and rode down to the Sheep heid, opposite Duddingston Loch. Back streets tood us to a left turn onto Duddingston Rd W.
We rode straight into Duddingston proper and, after skirting round some road works, we found the entrance to Figgate Park, were we rode the South Bank of the Figgate Burn, up to the nice pond. Actually quite a green pond, jammed with what looked like algae. Anyway, curcumbikulating the pond took as round to our exit point at Mountcastle Creascent. We had got away with very little rain until then, but now the rain increased and we made for the lunch spot – the Espy – a foodie pub in Portobello. 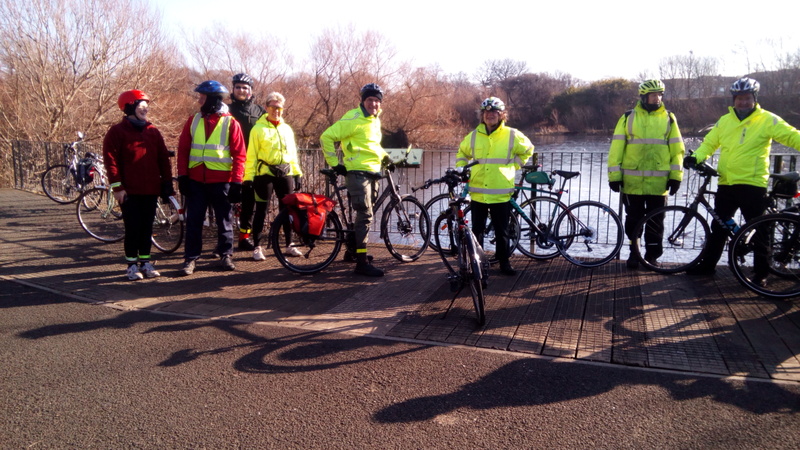 Alan led a group of 10 on a fine sunny day, up to blackford and into King’s Buildings. Emerging at mayfield Rd, we did a right & right again to enter Hermitage of Braid, a nice glen by the Braid Burn about 1.5 miles long. Ten of us gathered at Söderberg (formerly Peters Yard) in the haar. The forecast had said it would clear by 11am, but it stayed cold and foggy the whole day. Nevertheless most of the intrepid gang sat outside but I’m afraid your leader enjoyed a hot chocolate in the warm. Ten isn’t bad for a cold day in a ‘heatwave’, especially as there was one new face. We set off along the well ridden path to the canal – up the Meadows path to Leamington Bridge, then ride the canal to Harrison Road and then Russel Road. We didn’t climb the famous zigzags this time, but instead carried on round to Roseburn Park and followed the restored Water of Leith pathway for a but, before turning off to Balgreen and the Pinkhill railway path. This runs parallel to the Glasgow Road and is a hassle free method of getting to Corstorphine, where we admired the dovecot at the eponymous Dovecot Rd, before heading on the marked up quiet roads, though South Gyle Park, emerging to cross Glasgow Road using the lights near the jaguar dealer. Continuing on quieter roads we went past Craigmount School into East Craigs aka Bughtlin Estate aka Butlins – a large residential estate with a lot of paths running through it. As long as you head North you won’t get lost in it (very often). 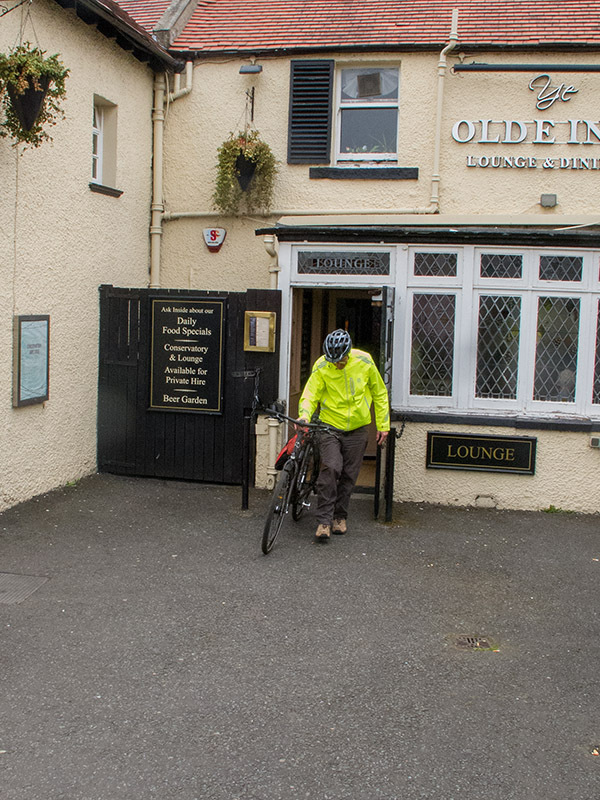 We crossed the Queensferry Road, again at lights, into Barnton where we used a little known path through a narrow strip of woods that run parallel to Queensferry Road, then into Davidson’s Mains Park then the Olde Inn for lunch. Return was swift. 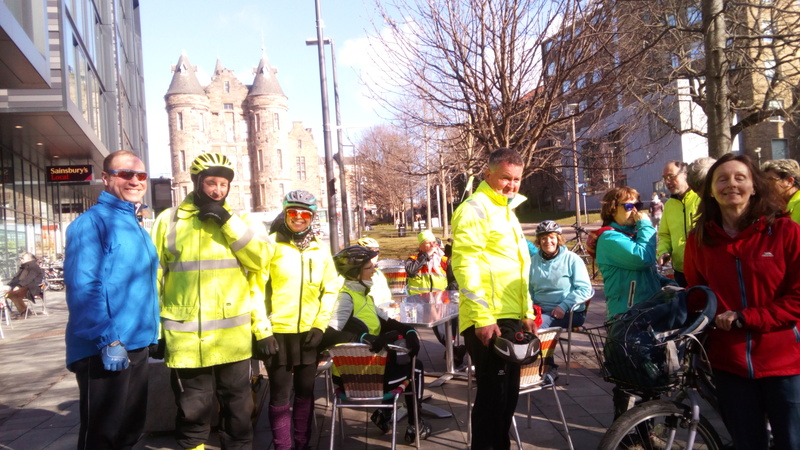 After regaining the Blackhall path, we exited at the Russel Rd zigzags and climbed the bumps to Fountainbridge, then canal to past the King’s Theatre and the Meadows, where the ride was closed, and a few enjoyed a coffee at nearby Victor Hugo’s. A chilly, but enjoyable, day. 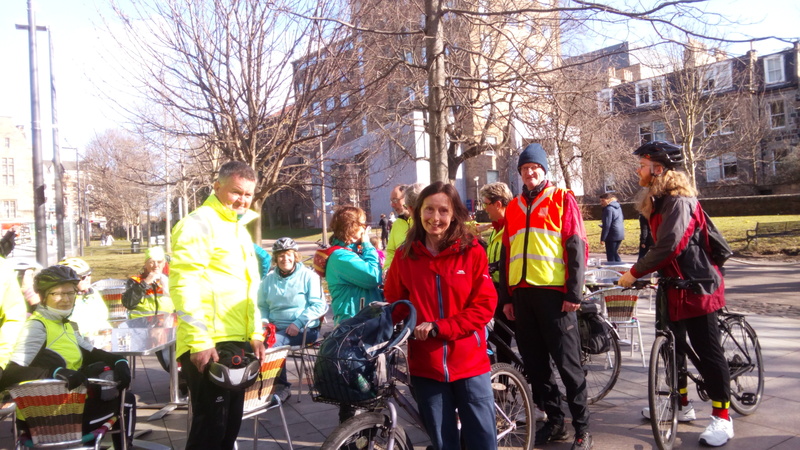 Knowing that such a lovely day would draw a healthy turnout for todays Easy Cycle prompted the leader to do a refresher reccie for part of the route, which resulted in cutting it fine for the start of the ride. So, slightly stressed and out of breath, it was somewhat unsettling to see what was, by anyone’s standards, an overwhelming number of participants. There were so many the leader never tried to count but thought he overheard a 20 Miler stalwart (Alan) saying that there were 39! Conventional wisdom would say split the group – so that was duly done – into 2 – with someone (Ken) suggesting 3 groups! The leader of group A quickly described the first section of the ride to the knowledgeable leader of Group B (Alan). So, off we set along the length of Middle Meadow Walk, turning right into Bruntsfield Links, down to the Leamington, Fountain Park bumps, Russell Road, Roseburn/Blackhall corridor to Silverknowes, then into Lauriston Castle grounds for a wander round the Kyoto Garden and a comfort break. Group B leader was then briefed about the next stage of the ride – but was a little unsure – so we arranged to re-join before the East Craigs section. It was then onwards through Davidson’s Mains Park, over the busy Queensferry Road and onto Clermiston Drive. A right at Drumbrae Crescent revealed a panoramic view over to Fife with the Queensferry Crossing dominating. 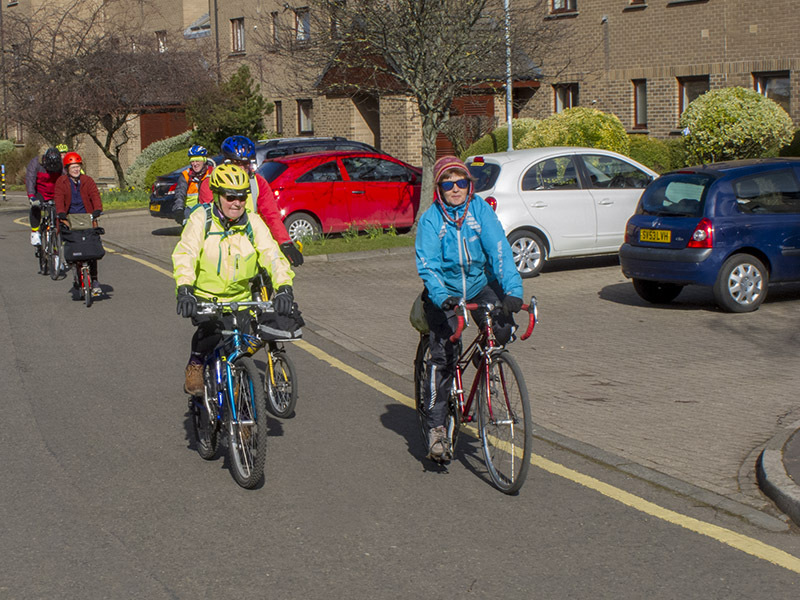 After passing the Drumbrae Leisure Centre, we crossed the Drumbrae North/South, through to Craigmount Avenue North and accessed the cycleway part the way down Bughtlin Burn before turning left and continuing to Craigmount High School. 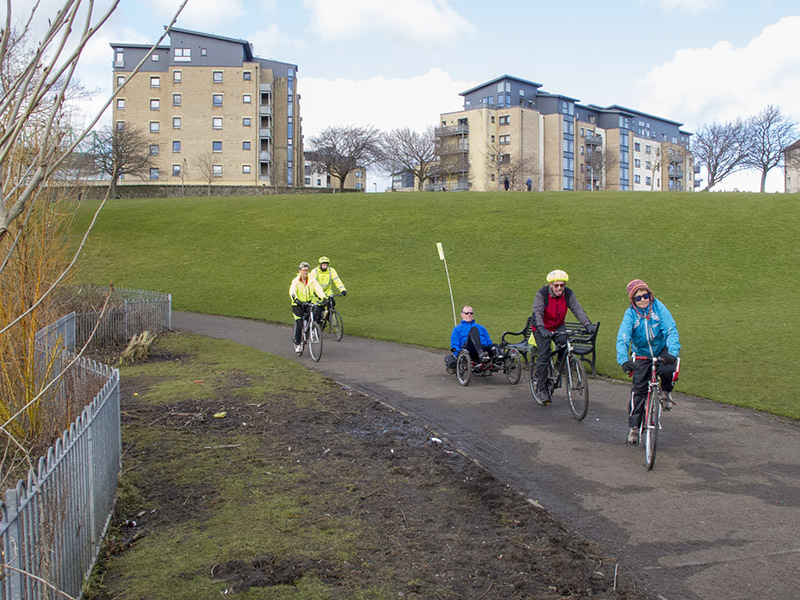 Down some inconvenient steps then a pedal along Dechmont Road and a short stretch along the Glasgow Road took us to our lunch stop at The Gyle Shopping Centre. For the purposes of trying something new, and as it was such a nice day, the leader decided to take the option of a cycle down the banks of the River Almond. 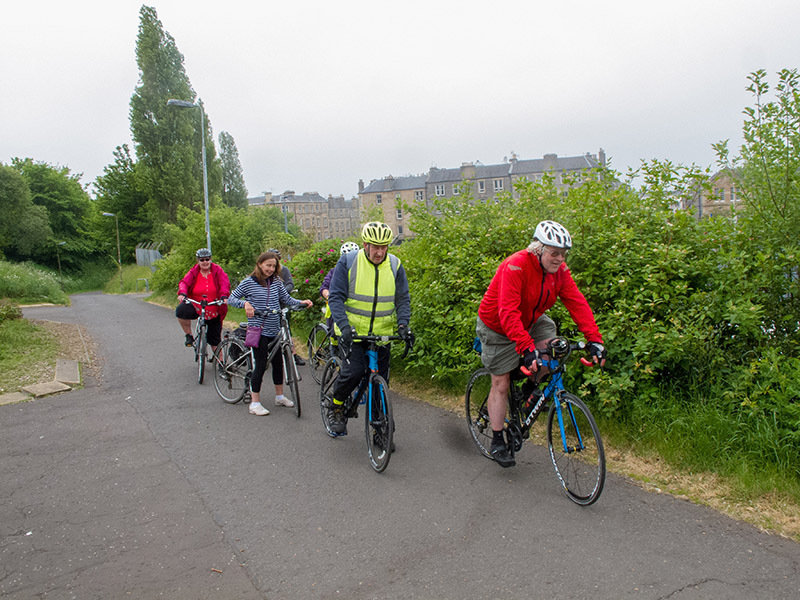 So off we set – through the tunnel at Edinburgh Gateway Station, along Turnhouse Road, Turnhouse Farm Road, Lennymuir and onto the rough path that leads to and along The River Almond. In retrospect this part proved very tricky indeed for New and Returning cyclists. Eventually, we reached the Grotto Bridge where we regrouped before setting off again down Cammo Road over Queensferry Road again, Braehead Road, Barnton Grove/Crescent and then into the woods that lead back to Davidson’s Mains Park. Through Tesco’s car park and onto the cycleway and, reversing the route we had taken in the morning, we arrived back at Middle meadow Walk, where the ride was declared over. The gamble of going down the river backfired, notwithstanding the fact that it increased the ride length, and the leader can only apologise to everyone adversely affected. (I have permission from Ida to post this ‘Relive’ video). Thanks to Alan Orr for leading Group B, Sarah Jane Davidson and Stuart Grant for backmarking duties and Ida Silkenat for the ‘Relive’ video. Today’s ride coincided with the start of British Summer Time. Right on cue, the weather turned dry and sunny with only a moderate breeze. But the ride was also one that was tinged with a sad memory. It was on this same ride exactly one year ago that we heard the news of the death of Logan Strang, a stalwart of the local cycling scene. Before setting off today, Glenn Brearley paid tribute to Logan, who was the driving force behind the setting up of EasyCycle. Glenn spoke of Logan’s good humour and constant cheerfulness. If there was any consolation, he said, it was that Logan had passed away while doing what he loved best: cycling with good friends in beautiful countryside on a lovely day. For today’s outing, about 20 riders turned out, including several first-timers. 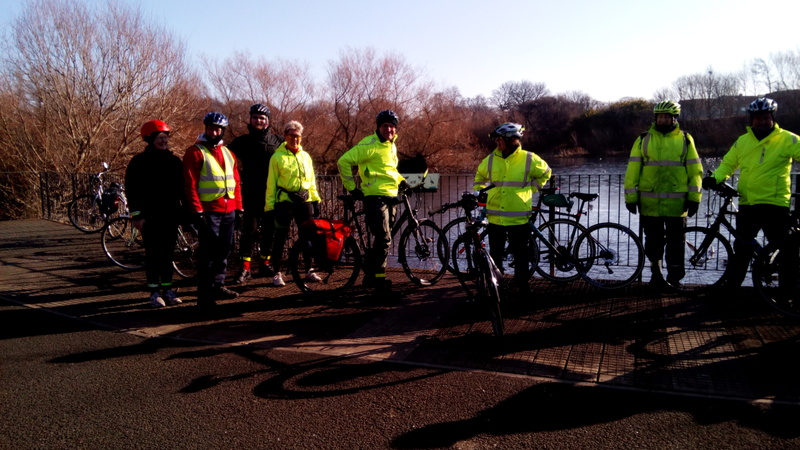 Our route took us through Holyrood Park (happily closed to cars on Sundays), then across London Road and along Marionville Road into the delightful Lochend Park. We paused to examine the ancient doocot, which was home to pigeons in the 16th century (a good source of protein) and was also used as a kiln for burning the clothing of victims of the 1645 plague (one hopes that the victims weren’t wearing the clothes at the time). We then joined the Restalrig Path for a smooth run into Leith Links. Negotiating the cobbles in the old part of Leith, we stopped for another dose of history: the 17th century Lamb’s House in Tolbooth Wynd (Mary Queen of Scots is said to have dined at an earlier house on this site after landing in Scotland on her return from France). The present building, restored in 2010, doubles as an architectural practice and the Icelandic consulate. Our route continued alongside the Water of Leith as far as Warriston, then back along the Goldenacre Path to Five Ways. Unfortunately, we found the Hawthornvale Path unexpectedly closed for resurfacing work. With no advanced warning and no indication of a diversionary route, we nevertheless managed to find a way through side streets to Lindsay Road. We then zoomed down the ramp into Ocean Drive, and so to our lunch stop at the Ocean Terminal. Half the group headed for the picnic tables overlooking the harbour, while the rest sampled the various eateries in the building. For the afternoon leg, we retraced our steps to Goldenacre, leaving the bike path at Warriston Gardens. 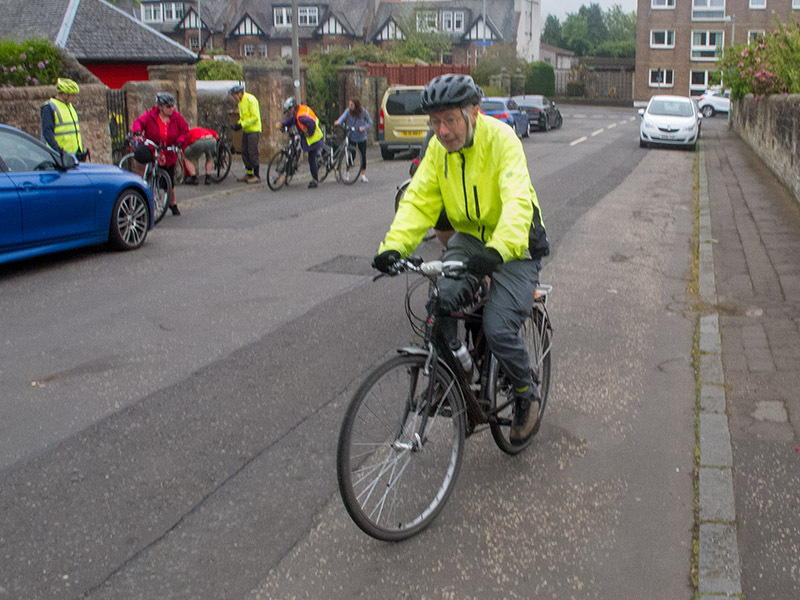 After heading west on Inverleith Place and through Inverleith Park, we continued up Carrington Road and Craigleith Hill Avenue – one of the few hills of the day. From the Craigleith path junction, we took the Roseburn Path to Russel Road, where several of the party went their own ways. For the last stretch, we followed the familiar route through the Telfer Subway (aka “the bumps”), onto the canal by the new Boroughmuir school and across the Leamington lift bridge. We had one more short climb up Leamington Terrace, and were then on Bruntsfield Links, arriving back at Middle Meadow Walk at 2.30. It had been a pleasant ride, in fine weather and at a relaxed pace – one that Logan would surely have approved of. Finally some nice weather! Cold, but some dazzling sunshine, no rain, and a slight Easterly wind (which nevertheless felt Baltic at 4 Deg C). Eleven riders greeted the sun soaked terrace of what was once Peter’s Yard, but is now Söderberg. There were no 100% first timers, but three returnees who have joined in recent months. 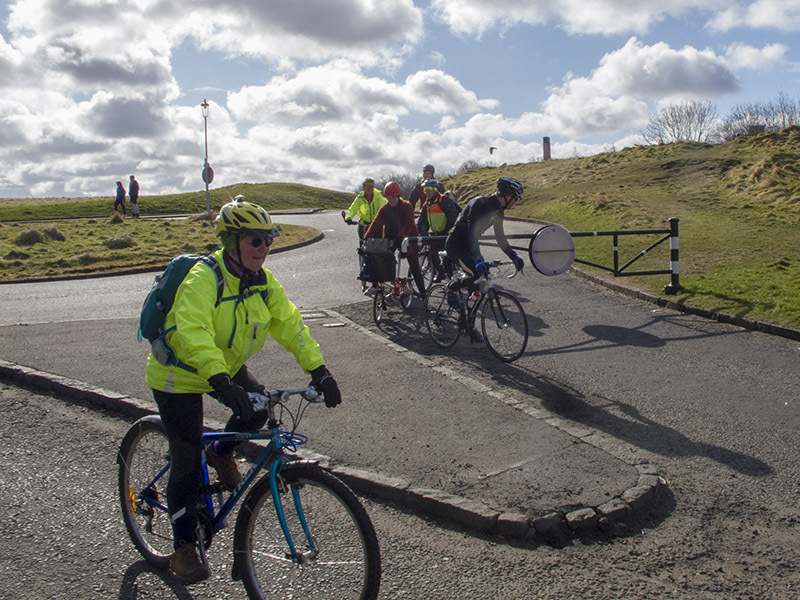 We set off down Duddingston Low Rd, enjoying the ban on cars on a Sunday, and a quick left at the Sheep Heid took us to a left turn on the Duddingston Road, where the entrance to Pilrig Park lay to our left. Pilrig is a tadpole shaped park, with a large pond at its head, hard to see on the map but very pleasant to ride around in. Named after the river Pilrig (aka Bonaly burn or Braid Burn) We circumbikulated the pond and took our exit at the playpark to Mountcastle crescent, exiting near the railway yards to Craigentinny. 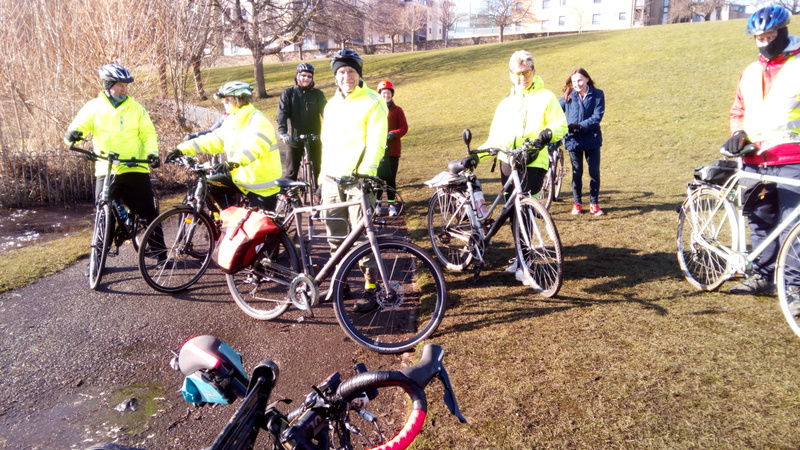 From Lochend, we followed the path to Bonnington, past St Mark’s park, then joining the long system of linked bike paths in North Edinburgh, at the Ferry Road path. This was the run home. 5 quick traffic free miles took us to exit the paths at the Russel Rd zigzags, then Gorgie Rd and Fountain bridge, canal, King’s theatre and Meadows. We closed the ride and sat down for lunch at the Doctors. No-one opted for extra cycling, the 14.5 morning miles being judged to be sufficient. A refuge in Wind and Rain – Portobello and Craigmillar castle park. Four faces turned up at Peter’s Yard. All experienced hands – no new joiners. That’s hardly surprising – The day before had seen horrendous gales with cyclists blown sideways & knocked off bikes. Today’s forecast had been for more of the same but with lots of rain too! The actual weather wasn’t that bad (but who’s to know that beforehand.) a bit of wind started up, and the air felt wet but didn’t actually rain much. Actually we’d better stop calling it Peter’s Yard, it’s Söderberg the Meadows now, like it or lump it. Anyway we set off down the Innocent and across the Jewel, plunging into the nicely tarmacced Bruntstane Burn path, pursuing the gentle climb and exiting at Joppa. Gentle when riding Eastwards that is. Turning Westwards on exit, we ran to the prom, then noticed the wind for the first time that day. We pushed upwind to the Baths then turned Left to exit the wind. Ha Ha no chance! the wind followed us round the corner. There being no escape, we shared our sweeties in a draughty Bellfield St, wondering if it was actually less windy on the prom. Up over the long footbridge and onto the new path that reaches to Duddingston Crescent. We should’ve turned onto the A6106, but we got lured off course at Bailie Place by a promising looking blue bike path sign. But it soon fizzled out into unsigned side streets and so we wiggled across to the A6106 where we should’ve gone in the first place. Back Westwards on the Innocent path at Forkenford, then Peffermill road and into Craigmillar Park, and sight of the Castle. It was too wet to ride the grass again, so we followed tarmac into inch park. Emerging, we decided against the planned visit to Hermitage of Braid (to avoid a probable mudbath) and rode Mayfield Rd back into Town. Lunch was at Summerhall. No-one wanted to take up the option of a further post lunch ride. It just wasn’t the weather for it. So, a good ride, and proof that it’s possible to defy the elements and have a good time! See y’all and let’s hope we have better weather in February.